Want to attend the LIFE can be perfect Bollinger Party? 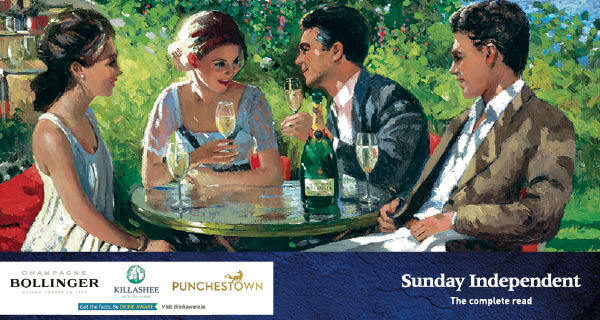 Don't miss your chance to attend the Life Can Be Perfect Bollinger party at Punchestown on April 30th with the Sunday Independent. Champagne Bollinger is proud to support one of Ireland’s foremost fashion events, the Bollinger Best Dressed Lady at Punchestown, which takes place once again during the Punchestown Festival from Tuesday 30th April to Saturday 4th May 2019. Champagne Bollinger, the iconic Grande Marque respected and beloved the world over, is proud to be associated with an event that epitomises the company’s tagline of "Life Can Be Perfect": expect great wine, glamorous fashion, good company and thrilling sport at Ireland’s most anticipated race meet. Ten very lucky LIFE magazine readers will be invited, along with a friend, to attend this amazing experience at the Punchestown Festival which includes Reserved Enclosure tickets to the day’s racing, glamorous style and great fun. One of the ten lucky readers will also win a fabulous overall prize of a luxurious night for two on Tuesday April 30th sharing a superior double room with dinner for two and a full Irish breakfast at the elegant Killashee Hotel. The Bollinger Best Dressed Lady competition begins on Tuesday April 30th 2019 and promises to be an amazing sporting and social event combining history, spectacle, glamour, excitement and prestige. Where is the Life Can Be Perfect Bollinger Party? The competition is to win one of 10 pairs of tickets to the Life Can Be Perfect Bollinger Party on April 30th at Punchestown. Plus, one of the 10 lucky readers will win an overnight for two at Killashee Hotel. To enter the competition, fill in your details and answer the question. The competition runs from April 14th to 21st until 11.59pm.